It has been a busy week in Armenia, and after having seen too many medieval monasteries and khachkars and carpets, and met with so many artisans and manufacturers and traders, I am exhausted and ready to go home. 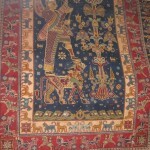 But I must not forget my primary mission here in the Caucasus: I came for the carpets. So an overall assessment of the state of the Caucasian rug, both old and new, is in order. The musings that I have summarised below are based on empirical research, if we can call it that—what I have seen and experienced at several carpet factories and workshops, as well as many carpet showrooms and dealers.